Daily Commentary – Friday, December 21, 2012 – How Do We Protect Our Children After the Sandy Hook Shootings? 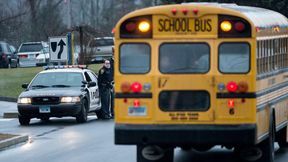 … Already, gun-rights opponents have begun scoffing at the notion of armed guards in our children’s schools. That doesn’t prevent the gun-rights opponent-in-chief from relying on a government-provided security detail to protect his own children. On any given school day, no fewer than 6 marked Secret Service police cars surround the Sidwell Friends School, where the Obama girls attend. In these cars, good guys are ready to respond with deadly force to any threat of harm to the first daughters.